Animation Career Review makes an annual list of the best animation schools in the world, taking into account mainly how provided courses address new trends and market needs and practices. In its commentary on the ANOMALIA programme, the server states: „It is important to recognize that animation education never stops. And it certainly doesn’t end after a 4-year degree. Working in the animation industry means constantly learning; learning new tools, new plugins, new techniques. ANOMALIA, a professional training and 3D animation network, caters to exactly this style of learning. It may be a little strange to add unaccredited ANOMALIA to this list but their summer courses and video teaching sessions are beyond reproach. This isn’t a rinky-dink set of courses though, their guest lecturers and teachers are veterans in the industry who work for institutions and studios like Animation Mentor, Pixar (multiple teachers) and Les Gobelins. Their courses include subjects like Pantomime for Animators, Studio Pipeline and Character Design for 3D. The head of the education programme David Toušek welcomes the praise: „We appreciate this as of now regular recognition. It is a testimony to the quality and the practical philosophy of our programme given by a respected authority. The philosophy of professional education in modern animation with participation of world-renowned experts is basically Czech animation’s only hope to globally reclaim its former professional and artistic level. ANOMALIA does not mean just 3D animation which our region perceives as an unwanted Cinderella. ANOMALIA addresses the whole spectrum of development beginning with project concepts, storyboards and graphic designs. The key experience is teamwork on a concrete project. In this respect, ANOMALIA has no match in the Czech Republic. This recognition is of importance not only in the context of the Czech Republic but of the whole central Europe. No other school from this region made it onto the list, which is a shame. But that makes our presence in the list all the more special. This year, however, we noticed a very important observation in the commentary: „Few schools on this list look as fun as this one!“ There is nothing more important in animation than passion and enthusiasm. It is an honour for us that ANOMALIA is seen as a fun school because our long-term goal is to follow Komensky’s „School by Play“ tradition. The ANOMALIA education programme is composed in a way that enables to effectively prepare classic animation students and professional for reaching a necessary expert level in modern 3D animation. Acquired knowledge and skills are the standard in the animation industries of developed countries. 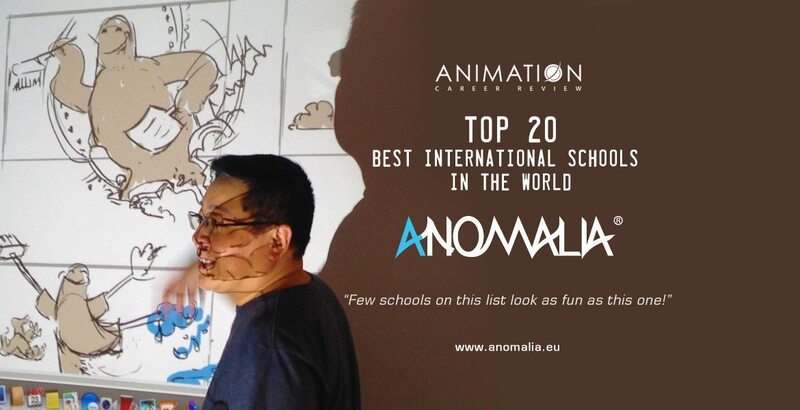 ANOMALIA aims to fill the gap in the classic animation tuition at specialized schools and universities in the Czech Republic and Eastern Europe. Thanks to the best professional animators from renowned studios, ANOMALIA increases the professional level as well as the employability of animators both in the Czech Republic as well as abroad. „We want ANOMALIA to contribute to the development of new and innovative processes in modern animation by utilizing the professionalism and the skills of the animators in the Czech Republic as well as abroad,“ explains Toušek. The ANOMALIA courses have been organised by the 3BOHEMIANS animation production company since 2008. They are traditionally held in the beautiful town of Litomyšl with lecturers from renowned studios such as Pixar Animation Studios (Toy Story, Monsters Inc., Finding Nemo, Wall-E, Up,, Brave), DreamWorks, Valve, and Aardman Animations (Wallace and Gromit, Flushed Away, Pirates! The Band of Misfits). Currently, we are preparing a new series of courses for the summer. The 3BOHEMIANS production company has produced four short films during the last five years. The animated short TELE-VISIONwas selected for the prestigious Los Angeles festival Siggraph in 2010. Also Noro Dřziak, the Czech Lion Award winner for Alois Nebel, has had his share of festival success with his film Wildlife Crossing created in collaboration with PIXAR’s Anthony Wong. The film was supported by the State Cinematography Fund and won several awards for the best films for children – for example at the Animayo 2015 festival at the Canary Islands. The film was also awarded the prestigious Vimeo Staff Pick seal. This helped the film to get more than 136 000 wives on Vimeo. Wildlife Crossing has attracted attention by the world expert community, was published in the 3D WORLD, a worldwide magazine that featured it on its cover and 5 pages.